Whether you are looking to define boundaries in your garden, conceal an eyesore, zone certain areas to give your outdoor space a new dimension, or simply make existing borders look more decorative, garden fences are a great way to achieve it. Hardwood is the ideal choice of timber, but as softwood is more affordable it might be preferred and can be just as effective if well cared for. If you choose timber, remember to check how it has been treated. Fencing is commonly either dip-treated (where the wood is immersed in preservative), or pressure treated where it is also treated with preservative but dried first. This is longer lasting but comes with a higher price tag. Dip-treated fences need periodic re-treating so it might be worth investing in a paint sprayer for regular reapplications of a fence stain. Fencing can be bought in two ways — you can either have a bespoke design built to specific dimensions, or purchase ready-made panels in standard sizes. Whichever option you choose, we have plenty of garden fence ideas on offer; however, which is best for you should be determined by purpose and property type. Installing a fence as part of a bigger garden project? Find out how to plan, design and cost your garden transformation. Erecting fencing is within the grasp of competent DIYers, but if doing it yourself, it’s best to ask someone else to help. Fences, walls and gates do not require building regulations approval, but it is important that they are structurally sound. New fencing will not usually require planning permission either; however, if you live in a listed property, or in the curtilage of one, then you will need to seek listed building consent. Decide whether you want to set your posts in concrete or use post supports. Metal post supports are quicker and easier, but can be weaker. Install your fencing by putting up the posts and panels alternately as you go down the line. Doing it this way should result in the correct spacing. When installing posts in the ground, ensure that at least a quarter of the total height of the post, ideally 60cm, is below ground level for stability. Prolong the life of your fence panels by using pressure treated gravel boards below the panels. Fences on a slope need to step up or down the slope. Leave hedgehog holes under solid fences so these creatures can move from garden to garden. Use post caps to protect the timber from rain and create a more attractive finish. Use thicker, 100mm posts for heavy panels for additional strength. To mark rear garden boundaries, solid timber fencing, such as closeboard or lap panel, is best. 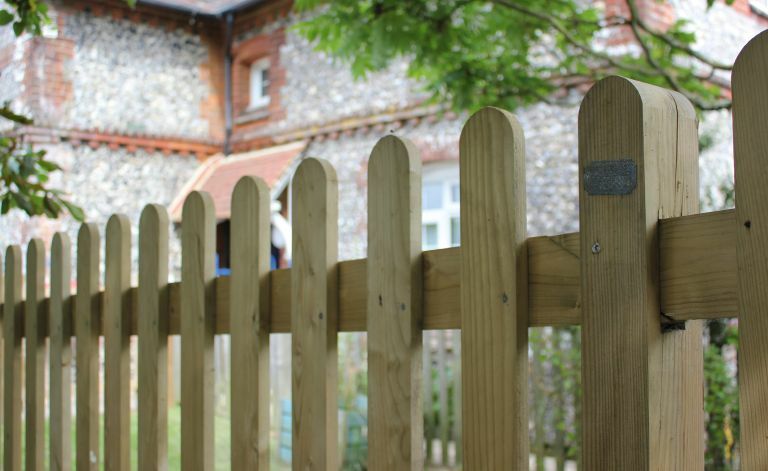 Closeboard, also known as feather edge, is composed of vertical feather-edged boards fitted to a sturdy frame of posts and horizontal rails, while lap fencing, also known as waney or overlap fencing, is made from waney-edge boards that are partially overlapped and fitted horizontally onto a timber frame. Each has its own benefits: closeboard fencing is stronger and more weather-resistant, making it better suited to exposed sites. It can be bought as individual panels, or featherboards can be purchased separately and fitted to a frame, allowing for an uninterrupted stretch of fence. Meanwhile, lap fencing generally only comes in panel form and offers a more affordable option. If you want to screen off different areas within your garden, then strength and privacy won’t be as paramount, and you can afford to use a style that is less robust. Traditional square or lattice trellising is a good choice for zoning, particularly for sectioning off a separate sanctuary area without blocking out sunlight. What’s more, it’s great for growing climbing plants against to create a living wall. Alternatively, slatted screening can be used for a more contemporary backdrop. Treat your fence as you would a feature wall in the home to add interest to a vertical space. This could mean painting a section of it in a bold colour, or using a patterned panel to create a focal point. Picket-style fencing provides a barrier without cutting off your plot from the outside world – the low height invites interaction, while the gaps between pales give a glimpse of the garden beyond. This type of fencing is great for sectioning off a vegetable patch for protection from pets and children. For increased privacy, grow a hedge behind the fence or allow climbers to tangle between the rails. Get more advice on how to improve privacy in your garden. Another option suitable for both screening and boundaries is woven hurdle fencing, which is usually made from willow or hazel. With a rustic, natural look, this type of fencing is well suited to traditional properties, but has practical benefits, too: woven in situ it can be shaped to fit curved boundaries, and its open structure makes it wind-resistant. If you are looking for a full-height fence, woven panels can provide strength and will protect plants from harsh winds, while letting sunlight through. Note that they are very appealing to climbing plants that may use the weave to anchor their tendrils. This can create a lovely living wall, but will damage the panels over time. Don't shy away from modern looking slatted screens. Inject a little boho glam into your traditional garden by slinging garden lights from them (the slats are perfect for hooking things on to) to create a twilight entertaining zone. They are also fab in the day as they create shade while allowing some light to stream through. The industrial look works really well for period properties. Add an edge to a garden of pretty meadow flowers with a hardwearing metal fence. There are plenty to choose from, but we like cut-out designs which won't look too heavy in a traditional scheme. Come autumn and winter, let your fence bring colour to your garden when the plants have died away until next spring. You can buy panels which are pre-treated in coloured stains, but otherwise, take advantage of the large range of fence paints on the market. Barely-there wire trellis can be used to support a number of climbers including favourites like roses and clematis. While you may not want to use this method for the external boundaries of your garden, it can help you break your garden up in to different areas and maximises the planting potential of your plot. Wrought iron railings are another option for a period property. Frequently used to the front of properties they create a boundary that looks imposing from a security point of view, without blocking the view of the home. They are strong, can be painted in any colour you can find as metal paint, and require little maintenance. Restoring railings in a period property? Find out how to clean, repair and repaint old iron railings and gates. While not strictly speaking a fence, you can create a beautiful natural boundary with a retaining wall made from vertical oak sleepers. This will form a raised bed of sorts that can be planted with tall grasses for height, or low herbs and shrubs. Find out more about creating a living wall in our guide. Looking for garden fence ideas that really show off your planting? One way to create this is to paint or spray your garden fence a dark colour, such as deep blue or black. Then position light-leafed plants in front of it for a dramatic contrast.